Nextant 400XT is designed and built by Nextant Aerospace. The spacious cabin of the 400XT accommodates eight passengers. Graphic image of the 400XT's flight control and information systems. The Nextant 400XT is a single-engine light business jet designed and manufactured by US-based Nextant Aerospace to operate on domestic and international air routes. It is an extended version of the Beechjet 400A business jet. The 400XT took off for its maiden flight from Cuyahoga County Airport in September 2010. The aircraft received US Federal Aviation Administration (FAA) approval in October 2011 and European certification was granted in December 2012. Nextant Aerospace unveiled the 400XT Business Jet at the 11th Annual European Business Aviation Convention and Exhibition (EBACE), held between 17 and 19 May 2011 in Geneva, Switzerland. Flight Options awarded a $150m contract to Nextant Aerospace in October 2010 to supply 40 400XT jets. The first aircraft was delivered to Flight Options in October 2011 at the 64th National Business Aviation Association (NBAA) Annual Meeting and Convention. 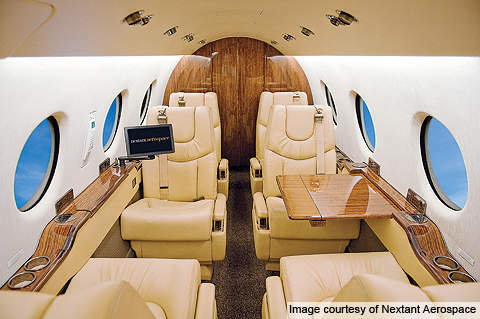 Nextant Aerospace delivered its 16th 400XT business jet was delivered to a customer in Czech Republic in August 2012. Asia Pacific Jets awarded a contract to Nextant Aerospace for the delivery of ten Nextant 400XT business jets, in August 2012. Nextant Aerospace handed over a Nextant 400XT aircraft to Switzerland-based TAG Aviation in February 2013. 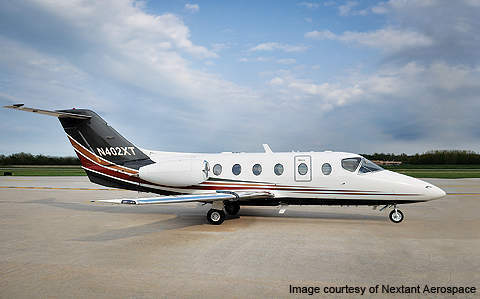 Nextant Aerospace designed the 400XT by making several modifications to the Beechjet 400A. The FJ44-3AP propulsion was used in place of the Pratt & Whitney engine of the 400A. New features are incorporated, such as an upgraded avionics suite, new engine nacelles, pylons, engine cowling, engine beam and mounting systems, along with a horizontal stabiliser. EMTEQ signed a contract with Nextant Aerospace in September 2010 to provide an interior lighting solution for the Nextant 400XT modernisation programme. The company installs ELW30 LED wash lights in the aircraft to produce bright, coherent lighting. 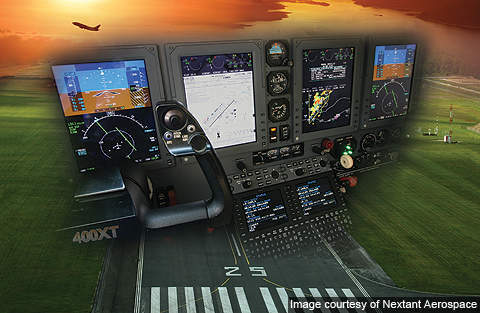 Rockwell Collins was awarded a $3m contract by Nextant Aerospace in October 2010 to supply a ProLine 21 avionics suite for the 400XT. These kits reduce the aircraft’s maintenance cost by 30% and weight by 75lb (34kg), while decreasing the workload of the flight crew. The 400XT is equipped with a ProLine 21 avionics suite. The flight deck consists of two LCD-compatible primary flight displays, one multifunction display to show the navigation, flight instrumentation, fuel and engine data to the pilot. The flight deck also features an integrated flight information system (IFIS), XM-satellite radar, an additional multifunctional display, traffic collision and avoidance system (TCAS II), attitude and heading reference system (AHRS-3000S), global positioning system (GPS-4000S), radio tuning unit (RTU-4200), database loader (DBU-5000) and control display unit (CDU-6200). Other avionics include a flight management system (FMS-6100), APS-4000 autopilot, a communications system (VHF-422C), navigational systems (VIR-432), automatic direction finder (ADF-462), distance measuring equipment (DME-422), terrain awareness and warning system (TAWS 8000), mode transponders (TDR-94D), dual marker beacons, dual glideslope receiver and dual digital clocks. The 400XT features a roomy cabin to accommodate eight passengers in two seating areas. The cabin was designed to render passengers with in-flight access to 53.2ft³ of available volume in the baggage compartment. The cabin features cabin management systems, an in-flight entertainment system, LED lighting and an Aircell Access 4000 voice and data communication system. It can be divided into two layouts, namely business and executive. The business layout features seven seats, a galley on the right and a belted lavatory seat in the aft compartment. The cabin baggage volume is 26.8ft³ and total baggage volume is 53.2ft³. The executive layout comprises six seats, refreshment galley on the left, baggage on the right and belted lavatory seat in the rear compartment. The cabin baggage volume is 32ft³ and the total baggage volume is 58.4ft³. The 400XT is powered by a single FJ44-3AP turbofan engine rated at 1,383kg of thrust. The engine is designed and built by Williams International, US. The FADEC compatible engine generates high thrust to weight ratio and decreases fuel consumption while minimising operational costs. The length and fan diameter of the engine are 1.58m and 0.58m respectively. The dry weight is 239kg. The time between overhaul of the engine is 4,000 hours. The 400XT jet can fly at a maximum speed of 851km/h. The cruise speed is 809km/h and the range is 4,000km. Vision Systems Aeronautics is active in the design, testing, production and customer support of systems for business jets, helicopters, regional and commercial aircrafts.